On a tip off received by police that underground Habarakada Wasantha who had fled after looting Nileka Jewellery store last June in the town of Matara was moving about with another gang, a team of police special task force had ambushed them around 9.45 pm today (26) under the flyover of Rukmalgama Road expressway and had taken steps to take them into custody. have suffered injuries from the counter-attack of the police after which the two of them were admitted to hospital where they had succumbed to death. It was identified that the two of them were Habarakada Wasantha and Meegoda Upul. 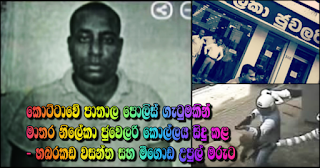 Haarakada Wasantha was the main suspect who was responsible for looting Nileka Jewellery store in Matara a few months before this. Police say that a machine-gun and a micro-type pistol were found in their possession. After the said act of looting and making good their escape, police eyes were intently focused on tracking Habarakada Wasantha during the las few months. During this period 74 pieces of jewellery and which were looted were found buried in front of a house of a friend of his in Habarakada area. Today he finally suffered his fate at the hands of the police.